Lazar Angelov is a Bulgarian professional bodybuilder, who went from pro basketball into the army, and after the army, bodybuilding. Angelov has had his up and downs in training, but one thing remained, and that was his love for training and keeping fit. He’s achieved world recognition for having one of the best bodies in the industry. With years of hard work, he’s made a lasting career as a professional bodybuilder. Angelov is also like other bodybuilders a huge influence on other people, and he has a big number of followers on his social media. He owns some of the best abs in the world. As a personal trainer, he has been able to transform the bodies of thousands of people and to make his motivation and knowledge contagious to them. Within this article, we’ll discuss Lazar Angelov’s workout routine and diet, and also the different supplements that he takes for his workout routine. 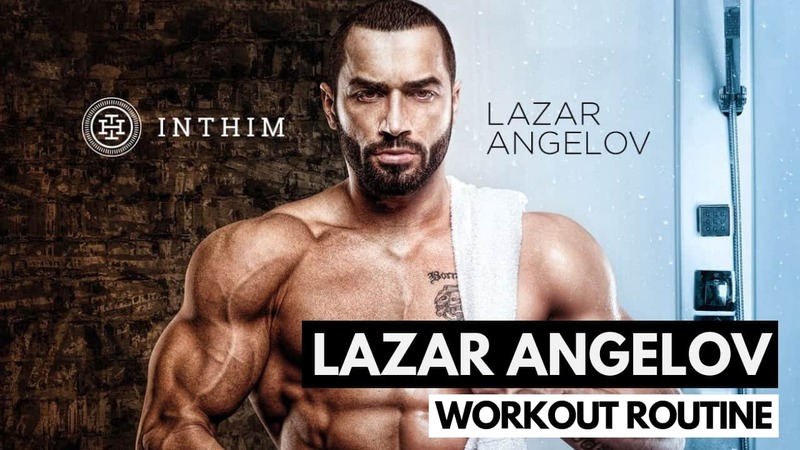 Within Lazar Angelov’s workout routine, he normally mixes up his workout to shock his muscles much like many other bodybuilders, including Ulisses Jr. and Simeon Panda. To maintain his shredded physique Angelov performs a combination of isolation and compound exercises. He usually does 4-8 reps in one set. Angelov also spends 20 minutes on cardio and he likes doing HIIT, which helps him in keeping up a lean muscle mass. Lazar keeps a clear method of calorie-restrictive diets to make sure he does not lose muscle mass. Lazar Angelov’s workout routine consists of numerous exercises. If you take a look at the exercises below you can see that he focuses on hitting up to 14 exercise on each exercise. On Saturday and Sunday Angelov has his both rest days, which is also very important. Within this routine, Lazar performs 9 exercises but for a total 4-8 reps each. On Tuesday, Lazar targets back and triceps. There are 6 different exercises that he uses for his back and triceps workout routine. 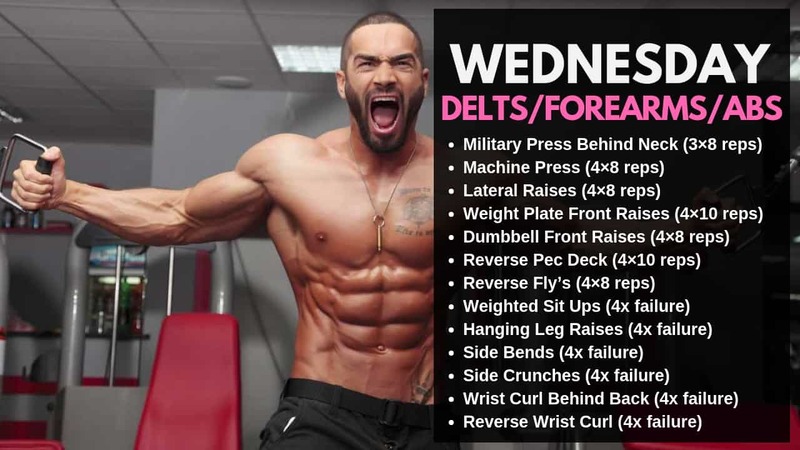 On Wednesday, Lazar performs a delt, forearms and abs workout routine, focusing on 13 major exercises. Every set is around 8 reps.
On Thursday, Lazar hits a triceps and biceps routine for 8 exercises. 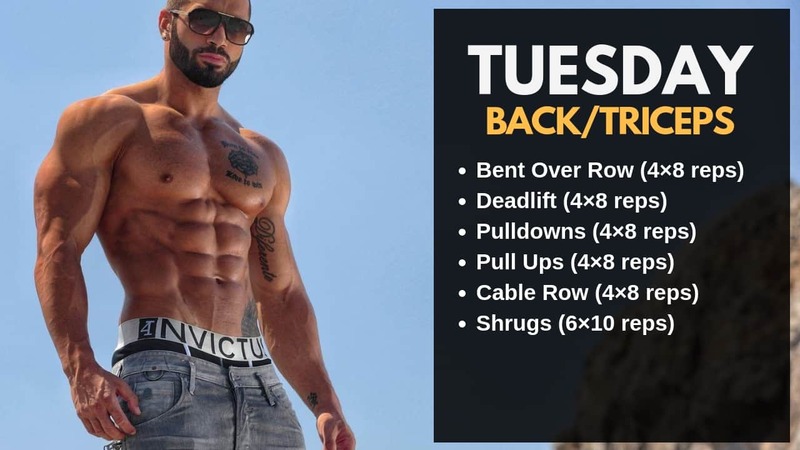 Each exercise is performed for 4 sets and 15 reps.
On Friday, Lazar hits a legs and abs workout routine by doing 14 sets of 4-12 reps in every exercise that he is doing. Both Saturday and Sunday is rest for Lazar. It’s the time when he relaxes and let his body recover. After a hard working week of his workout, the most important part is his rest. Now that we’ve covered Lazar’s workout routine, it’s time to move onto his diet. Lazar’s daily diet is divided into 6 meals by which he consumes about 245g of protein total. Typically there’s an interval of 2-3 hours between each meal. Angelov prefers to have a mix of low-carb and high protein food. So with that said let’s have a look at Lazar’s diet and the supplements that he takes daily to help get the most out from his workout. Lazar Angelov is one of the biggest and most admired names in the modern-day health and fitness industry. He is known for motivating people and promoting his online training program to help thousands of fitness enthusiasts around the globe. We hope that this article gave you a little more knowledge about Lazar Angelov’s workout routine and diet. 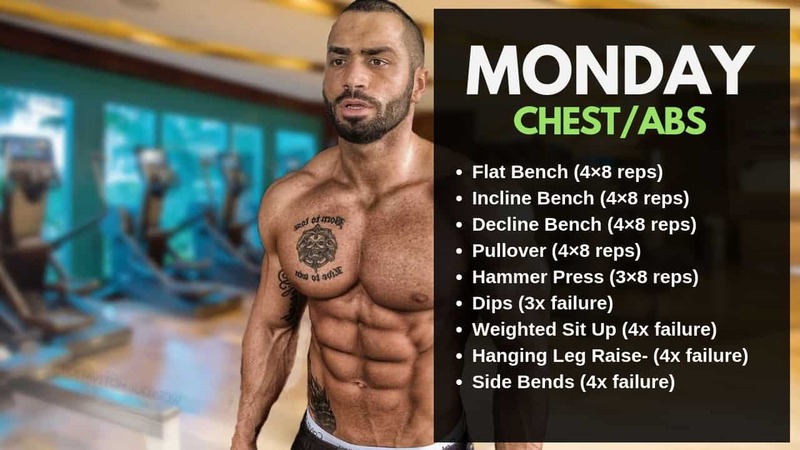 What do you think about Lazar Angelov’s workout routine and diet? Leave a comment below.